Ayam Brand is rooted in Malaysia from colonial times, with products that have been a well-loved household staple for five generations or more. Most Malaysians have fond memories of the brand, summing it up as " I grew up with it". 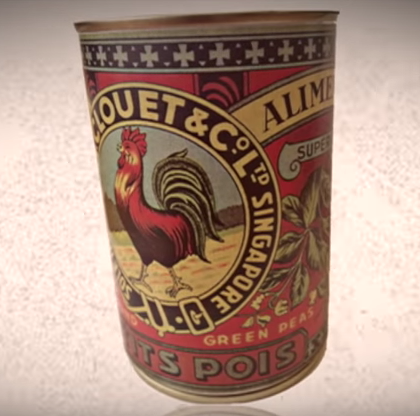 Ayam Brand was founded in Malaya in 1892 as a trading business for luxury products imported from France. The now iconic logo featured a rooster and the name of the founder, Alfred Clouet. Locals simply called it "Ayam Brand" or "Cap Ayam" from the image of the rooster. The local nickname stuck and a few decades later the Alfred Clouet brand was officially renamed Ayam Brand, that has grown into a global brand with a pronounced Malaysian character. At the time of Malaysian independence, the name of the company, " Clouet Malaya" ceased to exist. A new company called A.Clouet and Co. (KL) Sdn Bhd was established in 1957 in Jalan Ipoh in Kuala Lumpur. A member of the Negeri Sembilan royal family, the late Tunku Tan Sri Mohamed Tunku Besar Burhanuddin was originally one of the main shareholders. Today, his son Dato Mu'tamir Bin Tunku Tan Sri Mohamed is still one of the main shareholders of the company, very much in keeping with Ayam Brand's values of heritage and continuity. While the Ayam rooster has barely changed over the years, the story behind the iconic red and yellow colors of Ayam Brand sardines and mackerel in tomato sauce are know to very few. These colors were introduced in 1960 to highlight the product' superior quality, as Ayam Brand began to source premium sardines from Japan. The packaging become a symbol of the region with consumers identifying Ayam Brand Sardines by the brand's colors of red and yellow. Beginning in 1975, Ayam Brand began implementing more stringent controls on the products quality of its sardines, investing in a factory in Taiping, Perak. Toda, with 1,200 Malaysian employees it is the biggest sardine cannery in South East Asia. All Ayam Brand sardines that are available in more than 30 countries internationally are proudly canned in Taiping. Ayam Brand factories hold the highest certification with respect to quality, cleanliness and hygiene. The brand is among a select few to be authorized to export to the United States of America and Europe. One of the most important in Malaysia is JAKIM certification, which covers not only religious requirements but also certifies the quality and hygiene of production. Ayam Brand features on JAKIM's 'white list' of the most reliable food companies. Ayam Brand is renowed for its quality. The production processes are still very manual as special care is required. Besides stringent fish selection, more than 1,000 qualifies Malaysian workers cut, gut and wash the sardines by hand. The sardines are also gently placed in cans by hand so that the fish remains in perfect condition. Quality is the basis for all Ayam Brand products, with 120 staff employed in the quality department to ensure that the highest standards are not only maintained but constantly improved. Ayam Brand sardines originate from cold seas. They differ from local sardines in that they are fattier, juicer and therefore tastier. Despite being a staple, Ayam Brand sardines are perceived to be higher priced compared to fresh fish. The truth is that after fresh fish is prepared to be higher priced compared to fresh fish. The truth is that after fresh fish is prepared (gut head and tail removed), it loses close to half its weight, which will then be further reduced by an additional 10 to 20% while cooking. Compare this to quality canned sardines where the full weight of the fish can be consumed, quickly and conveniently with no mess in the kitchen, and no clean up after. This explains why canned sardines remain an affordable source of fish meat. For more information on Ayam Brand, please visit www.ayambrand,com.my or https://www.facebook.com/AyamBrand.Recipes .